Transformations and crops, as well as insertion of various items, are also available. All in all, the Samsung U900 Soul offers you virtually all of the most popular editing capabilities you could possibly use on a cell phone. We still doubt it anyone takes image editing on their mobiles seriously. Armed with generous internal memory of 128MB and a microSD card slot, the Samsung U900 Soul has every premise to act as a portable music player. It is therefore important that the music player application be up to the task. Not that it's that hard of a task but still sometimes it's the small things that mess up the big picture. Luckily this is not the case with the U900 Soul. The music player can naturally be minimized to play in the background. The player in Samsung U900 Soul has undergone some changes when compared to, say, Samsung U600 but the functionality isn't greatly altered. It has no equalizer presets, but sound effects instead. The difference is that the sound effects also include wide and surround options in addition to the seven available presets. There are also three types of visualization and you can enable fading out on stop if you like. "...The Music player application allows filtering tracks by author, album, genre and composers. You can also choose to play either the tracks you've recently listened to, or the ones that you've played the most. If that doesn't seem enough, you can create your own custom playlists..."
The video player is one of the phone features to reap the benefits of the touchpad. It gives you all the controls eliminating irksome labels over your video. Controlling the video player with the touchpad covers all essential features, including fast forwarding and rewinding, and these are easily accessed without going through menus. In addition, you can enjoy the videos fullscreen. The camcorder works in MPEG-4 format, so there is no doubt the player supports it. That makes converting your favorite clips and movies to watch on your Samsung U900 Souls a piece of cake. Plus, the great picture quality of the display lets videos be enjoyed in their full shine. A lot has been speculated about the integration of the Bang & Olufsen ICEPower amplifier into the latest Samsung handsets. Some claim it's giving Samsung handsets a definite edge in terms of sound quality. Well, this speculation is completely disproved by our audio lab tests. It is obvious that what ICEPower gives Samsung is reduced power consumption, not better audio quality. In fact, our tests revealed that Samsung U900 Soul doesn't differ that much from the good old Samsung D900 and the latter doesn't have an ICEPower module. This however should by no means be considered a criticism, as the audio quality is truly great. In fact, even though the Samsung U900 Soul is not really a dedicated music phone, it offers better audio quality than most of the handsets we've tested so far. 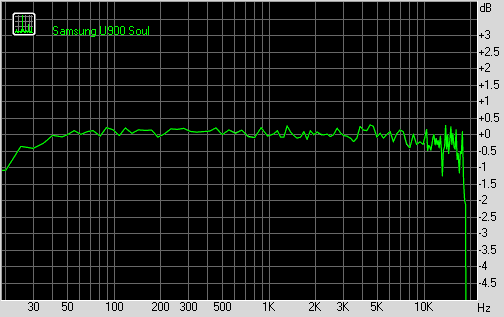 Unfortunately, the Samsung U900 Soul lacks a standard 3.5 mm or even a 2.5 mm audio jack. You're therefore limited in your choice of headsets, unless of course you find a suitable adapter. Then again, you can use a Bluetooth headset - both mono and stereo will do, as Samsung U900 Soul supports the Bluetooth A2DP profile. You can find more info about our audio quality test here.